We have all heard of the famous "Dukes of Hazzard" television show which aired in 1979. I will bet that not too many people know that we had our own "Dukes of Capreol". 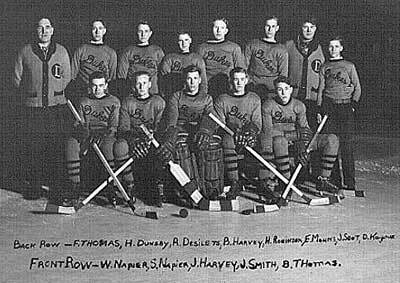 In the early 1930's Fred "Duke" Thomas put together a hockey team called the "Dukes of Capreol". This was another powerful team comprised of Capreol boys. The coach of the team was the "Duke" himself Fred Thomas. Some of the players on the team were Romeo Desilets, H. Dunsby, B. Harvey, H. Robinson, Elroy Mohns, J. Scot, Bill Napier, J. Harvey, J. Smith and Balfour Thomas. During their haydays, the "Dukes" could hold their own with any of the out of town teams that challenged them.